The stepped shaft shown in the figure is to rotate at 900 rpm as it transmits 7000 Nm torque from a turbine to a generator and this is the only loading case on the shaft. The material specified in the design is A 284 Steel (grade C) and design factor is given as 2. Determine/evaluate following cases for the shaft. c) Material yield criteria for selected material and occurred stresses. Step 1 : Write down input parameters (including material properties) which are defined in the sample example. Step 3 : There is a shoulder fillet in the shaft design and this geometry will raise stress . Stress concentration factor and maximum shear stress for shoulder fillet will be calculated for torsional loading . 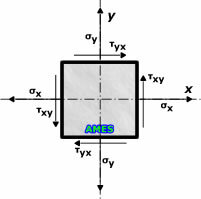 Go to "Shoulder fillet in stepped circular shaft" page for calculations. 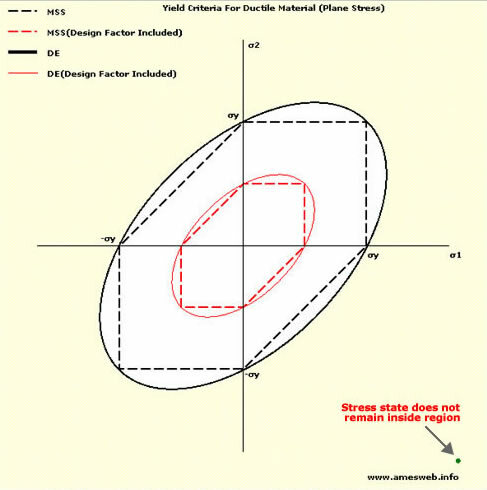 Maximum shear stress of 357 MPa occurred at outer radius of shoulder fillet. This is the answer of clause a) of the sample example. Step 4 : To calculate principal stresses occurred on the shaft, go to the "Principal/Maximum Shear Stress Calculator For Plane Stress" page. Note that the torsional loading of shaft results plane stress state on the surface of shaft so this calculator can be used. Principal stresses are calculated as 357 MPa and -357 MPa. This is the answer of clause b) of the sample example. Step 5 : Selected material (A284 Steel) is ductile since elongation at break is greater than 5%. For the evaluation of yield criteria for a ductile material with plane stress state , we can use "Yield Criteria For Ductile Materials Under Plane Stress(Static Loading)" page. According to results, the design is not safe for the given parameters and conditions. 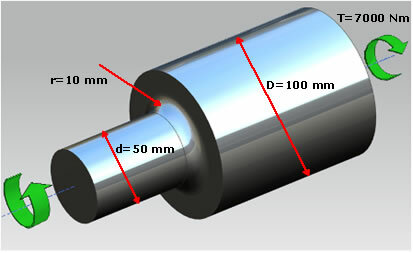 Shaft diameter or material shall be changed to satisfy required design criteria. Steps listed above shall be repeated to find dimensions or materials that satisfy required conditions. Note: In this example, the loading case is static and shaft material is ductile. According to Shigley's Mechanical Engineering Design Chapter 3 , for ductile materials in static loading, the stress-concentration factor is not usually applied to predict the critical stress, because plastic strain in the region of the stress is localized and has a strengthening effect. According to Peterson's Stress Concentration Factors Chapter 1, the notch sensitivity q usually lies in the range of 0 to 0.1 for ductile materials. If a statically loaded member is also subjected to shock loading or subjected to high and low temperature, or if the part contains sharp discontinuities, a ductile material may behave like a brittle material. These are special cases and if there is a doubt, Kt (q=1) shall be applied. In this example, since there is no information about temperature and shock loading condition of the shaft, the notch sensitivity factor q is taken as 1 and Kt is applied . The problem is fully solved with calculators which are summarized as follows. Torsion of Solid and Hollow Shafts Calculator To calculate maximum shear stress occurred on the shaft. Yield Criteria For Ductile Materials Under Plane Stress(Static Loading) To evaluate material condition against yielding for ductile material which is under static loading. Principal/Maximum Shear Stress Calculator For Plane Stress To calculate principal stresses for the point where maximum shear stress occurs.